Giro d'Italia's visit to Denmark has already generated some discussions, some of which deal with the routes and terrain of the three stages. But which statements are true and not so true about the 405 kilometers of Danish roads waiting for the riders of this year's Giro? Read the route analysis, too: Here's the three Giro stages in Denmark. Below, the website Danskebjerge.dk will comment on some of the dominant assertions concerning the Danish Giro stages. STATEMENT 1: The time trial is straight forward, literally. Partly true. The terrain is flat, yes, but in the beginning there is quite a lot of 90 degree turns. It may prove decisive how each of the riders handle these turns, as there may be only a couple of seconds between the fastest at the finish. In addition rain can make the turns slippery and dangerous. 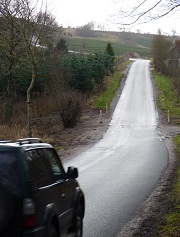 Smedebakken ("The Smith's Hill") is by far the toughest single climb which the Giro riders will meet on their way through the landscape of Jutland. STATEMENT 2: The hills of Lemvig and the uplands of Middle Jutland can be used as a springboard for decisive attacks. Probably no. None of them exceed 75 vertical meters, and the steepness is mainly below 10 percent. So they neither have the size nor the slope to create serious gaps. Even more important: They are placed so far away from the finish - in both cases 70 to 80 kilometers away - that the bunch will have plenty of time to catch eventual break-aways. STATEMENT 3: The hard wind at the North Sea may come as a surprise. Hardly. - Sure, the wind meets little resistance on its way to the coast, and the huge waves at the beaches of Jutland are well-known. But some tend to forget that there are sand-hills all along the coast road. They offer a significant protection against possible storms. If the wind will have a role to play, it will rather be inland - on the former moors. But then again: Although the wind is a much talked about factor when international fields appear in Denmark, it rarely has decisive impact on the races. 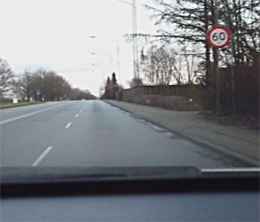 STATEMENT 4: The narrow Danish roads can be tricky. Perhaps, but the riders of the Giro won't see much of them while they're in Denmark! As opposed to the stages of the annual Post Danmark Rundt (Tour of Denmark - the biggest cycling event in the country), the Giro d'Italia routes consist of relatively few narrow, crooked roads. On the contrary, there will be long stretches of broad main roads. Of course, with the exception of sections in cities. The smallest roads in the open landscape are located at Lemvig (2nd stage) and in the upland around Ejer Bavnehøj (3rd stage). STATEMENT 5: Both stage 1 and 2 will end up in a mass sprint. Yes, probably. There is little doubt that the peloton will be able to maintain a constant high speed on the closing kilometers in both Herning and Horsens. And in that case, attackers must be extremely lucky to succeed. But of course, there is always a risk of crashes and other incidents that can disturb the sprinters' plans. We saw that at the world championships in Copenhagen, for instance, where Norwegian Thor Hushovd was among those who got caught in an unlucky position. STATEMENT 6: The Giro's visit to Denmark may prove a good bargain for the organizers and the country. Maybe! Such estimations are complicated. An recent analysis of the championships in Copenhagen has shown that the event generated a plus, thanks to the many cycling fans from abroad. However, three preliminary stages is not the same thing as a world championship. There's not quite as much at stake and thus not as much publicity. But even if the Danish Giro doesn't leave a surplus of several millions, there is still a lot to win in other ways - for example in terms of the prestige connected with successfully organizing a big event like this one.